Add brilliance to your documents with toner adhesion foiling. This special foil will stick to the dry toner that is used in most copiers and laser printers*. Our metallic reactive foil colors offer a consistently bright and vibrant solid color that will add a unique "pop" to invitations, greeting cards, business cards and so much more. The large variety of colors gives you the versatility you want. These colored metallic foil fusing rolls provide a unique foil can stick to smooth paper stocks of many thicknesses; it does, however, have problems sticking to textured papers. We also offer even more variety with holographic patterns, iridescent shimmering colors, and sparkly glitter foil rolls. Note: If you are using one of our Foil Fusing Machines, please select the 24" x 500' roll size, as they feature the 1" core that is required for use with the machines. Depending on your machine width, you may need to cut them down with the foil roll cutter, or call (866)537-2244 (866)537-2244 for a custom cut quote. Foiling is the process of adding a metallic foil to paper* to create a bright and vibrant finished piece. This is perfect for DIY'ing your own wedding invitations, creating business cards that will really set you apart, making prints to frame and hang on the wall, and so much more. These reactive foil rolls feature a toner adhesive on the back that will stick to the dry toners used in most copiers and some laser printers**. You can use a foil fusing machine to apply consistent heat (to activate the adhesive) and pressure (to ensure a clean and consistent application). Other heat machines, such as pouch laminators, may work as well, however, may require more heat testing and adjusting to get a perfect finished print. These metallic colors offer a solid and opaque foil that comes in a huge selection of colors, including multiple tones of the same color (for example, there are four different metallic gold foils available). 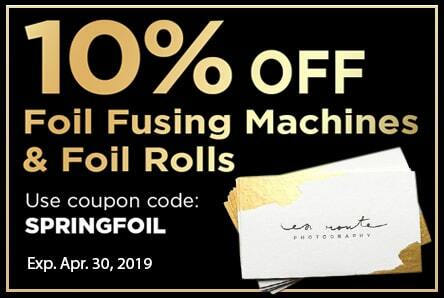 Foiling is a great way to create wedding invitations, award certificates, craft projects, business cards, letter head and anything else that could benefit from bright metallic color accents. Rolls can also be custom cut-down to size. * The adhesive applies well to smooth paper stocks of a variety of thicknesses. It does not, however, create a solid/consistent look on textured papers. ** The adhesive on the back of these foil rolls sticks to dry toner only; it will not work with wax based inks from laser printers. Featured in this video is our most popular toner foil color, Metallic Gold! Watch how this shimmery foil reflects and shines in the light, and see what you can do with gold toner foil in this short video. In this video we show you the four different "gold" options we offer, moving it slightly in the light so that you can see the variations and how each color changes as it reflects. We offer gold metallic foil in a basic metallic gold foil, a matte gold foil for a little less shimmer, a light gold foil for a slightly brighter look, and a rose gold 70 foil that has just a hint of pink. In this video we show you the two silver foil options that we offer side-by-side for easy comparison: Silver and Matte Silver. Watch as the swatch pieces are moved to see how the color and reflection changes in the light. Hi everyone! It's Mallory at Binding101, here today to show you the differences between our Rose Gold and our Copper toner foil fusing rolls. We offer two different versions of a Rose Gold toner foil; gold 70, which has a bit more of a rosy pink tint, and gold 95, which is a little bit closer to a traditional gold foil. In addition, we also offer two different copper toner foil options; copper 30 is metallic, reflective, and bright, and copper 40 is a satin matte finish. All of these foil fusing rolls do have a pink tint to them, which is extremely popular. I hope this short video has been able to display the different rose cold and copper options that we have in a way that makes it easier for you to select which color is best for you. Watch this video to see our new ROSE GOLD 70 foil fusing rolls, available in 8", 12", or 24" long rolls. Though difficult to capture the beauty properly on film, this video shows how the rose gold foil rolls reflect a beautiful metallic finish, while offering the pink/gold tint that is sweeping the nation. Our gorgeous new matte teal thermal toner foil offers a soft shimmer in a star-stopping winter teal. The smooth finish will look stunning on your business cards, letter head, stickers, or anything else you foil. Check it out side-by-side with our turquoise metallic foil to see just how elegant this option is. A part of our toner reactive line, this lovely new colored foil requires just a few things to work: a dry toner printed design, and a heat source like a laminator or foil fuser. Check the description for more info and where to buy matte teal foil online. We look forward to seeing you soon at Binding101.com, where we’re more than binding…much more. Compare the ROSE GOLD 70 (featured 1st) and METALLIC COPPER (featured 2nd) in this short video. Hi everyone, it’s Mallory Morsa at Binding101 and I wanted to show you some of the reactive foil applications that our customers just LOVE. As well as give you some ideas for the upcoming holidays. Check out this short video to see some foiling crafts that I recently finished, and call us if you have any questions or are ready to order. Foiling with a laminator is the preferred method for anyone not running production level quantities, but not all laminators will work well or produce the high quality foil. Here is a list of the top 4 best laminators for foiling. Q: How do I stop ink from transferring onto the carrier, and then onto future projects? Sometimes the toner that is not covered with foil may slightly transfer to the pouch carrier. It could potentially then transfer from the carrier onto your future projects. To prevent this from happening, cover any ink that is not covered by foil with some scratch paper. Q: How can I get the foil to stick properly? If your transfer is not perfect, it could be one of several factors: the paper, the toner ink, the heat, or the foil itself. These troubleshooting tips should be helpful in determining the problem, and helping you fix it. Q: What is the difference between Rose Gold 70 and Rose Gold 95? Both options are a tinted pink gold color, however, the Rose Gold 70 has a bit more of a pink tint to it, while the 95 is a milder pink tone. Both options are good sellers, but the Rose Gold 70 is more popular with most customers.